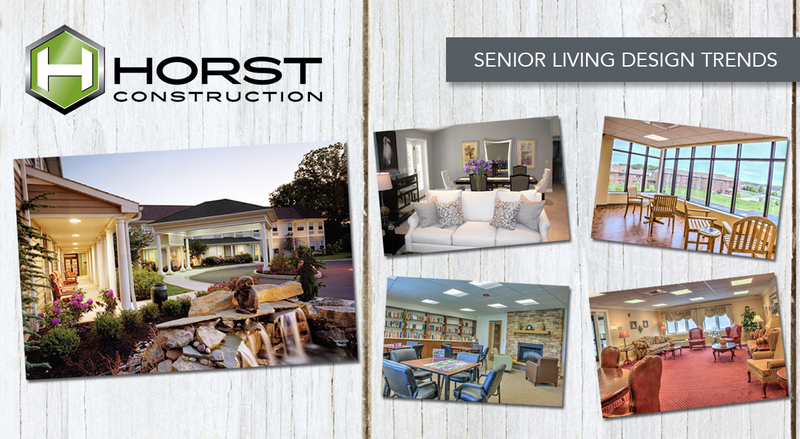 While we at Horst Construction consider ourselves to be experts in constructing senior living facilities, we also participate in many discussions at the owner level, advising our clients about the best ways to attract new residents and make facilities as welcoming and useful as possible. For this article, we have collaborated with interior designers, marketing teams, and other experts to share top design trends for 2018. Bringing the Outside In. Exterior features and finishes are influencing interior spaces to create a fresh and inviting atmosphere. One trend in flooring is to integrate both the design and materials from outdoor spaces—such as a patio—into the interior adjoining room, creating the appearance of an uninterrupted flow. Tactile Experiences. By tapping into our sense of touch, designers can create a space that is tied to our memories. Textural surface treatments, monochromatic trim treatments, and ceiling details are all trends to watch. Smart Seating. Dan Rexford, V.P. of Senior Living at Builders Design suggests bringing seating closer together to allow for engagement without unnecessary strain—especially for elderly people—and others—who may have trouble hearing in a large echo chamber. Bathroom Luxuries. When installing showers, small details can make the difference between ho-hum and luxurious. The addition of spa-like rain heads or body sprays elevates the shower experience and provides a feeling of indulgence. Movable Walls. By incorporating the use of moving walls, senior living facilities can combine open floor plans with flexibility. Spaces can be opened up for large group activities or sectioned off to create smaller, more intimate places. Breathing Room. Just like with the traditional housing market, outdoor living is very important to today’s buyers. Creating both public and private outdoor spaces adds appeal to any community. By adding a small patio, for example, residents can step outside for a breath of fresh air without a long trek to communal outdoor spaces. For more trends and insights, McKnights has a great article we would like to share with you. We also invite you to reach out to us directly regarding trends in cutting edge design, materials, lighting, energy saving options, and indoor-outdoor spaces. Contact us for more information.